Among folks fortunate enough to live outside the Snowbelt, all-wheel drive is usually brought up only in conjunction with pickup trucks and Jeep Wranglers. For those of us who have to deal with snow and freezing conditions for months every year, though, an all-wheel-drive car can be the difference between getting to work and getting stuck at the end of your driveway. 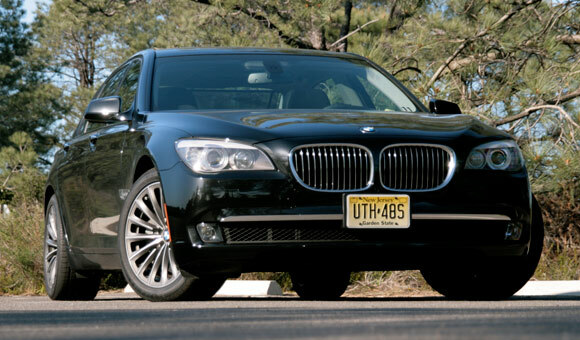 Indeed, here in Michigan, just about every luxury ride on the road wears an “x” or “4MATIC” or “Quattro” badge on its rump, signifying four-wheel power, with the BMW 7-series being one of the only cars in its competitive set not to offer all-wheel drive. Until now. Fitting all-wheel drive to a big rear-drive car, however, can run the risk of upsetting driving dynamics. Take the current BMW 535i xDrive. Like all xDrive systems, its variable torque split defaults to 40 percent front and 60 percent rear, with the ability to shuffle up to 100 percent of the available power to either axle should slippage occur. Yet, it understeers like a baseball player barreling headfirst into home plate because it's primarily focused on achieving maximum traction, rather than improving vehicle agility. Now imagine if the 7-series, which in short-wheelbase form has over seven more inches between the axles and at least 600 pounds on the 535i xDrive, were fitted with the same system. Dynamic disaster. So the engineers at BMW took that previous version of xDrive—currently used in the 3-series as well as the 5-series—and reconfigured it in such a way that the all-wheel-drive 7 handles just as well as, if not better than, its rear-drive sibling. Throw even the extended-wheelbase 750Li xDrive into a corner, and you’d think you were driving something the size of a 335i, with nicely weighted steering that gets a bit heavier as you go through a corner and the front wheels pull you through. Gone is the fun-killing understeer that was exhibited in the 535i xDrive, replaced by more neutral behavior. Among the systems that help the all-wheel-drive 7 dance better than previous xDrive sedans is “performance control,” a torque-vectoring system already featured on the two-wheel-drive 7-series that applies light braking to the inside rear wheel while adding power to the outside rear wheel, correcting for understeer without the driver ever knowing. Additionally, the 7-series is fitted with active front and rear anti-roll bars that adjust to keep the pitch of the big sedan going in its intended direction. Remember the 535i xDrive’s sole focus on traction at the expense of dynamics, and the resulting push? Perhaps the most important characteristic of the new 7-series version of xDrive is that it will variably adjust from the normal 40/60 torque split to, say, 20/80 or 30/70 or whatever when cornering—the car knows when you're trying to push it hard, unlike the 5-series—further accentuating the feel of rear-wheel-drive agility while maintaining the benefits of four driven wheels. Additionally, the system can switch to a 0/100 split when parking (to avoid binding), while also maintaining the ability to send up to 100 percent of available power fore or aft should one set of wheels completely lose traction. The front-to-rear power ratios are not fixed, though, which allows the car’s computer to adjust back to the normal 40/60 torque split as it deems necessary. The result is, as we said, one seriously fine-handling luxo-barge, although it must be noted that only eight-cylinder 7-series customers will be able to opt for xDrive. It will not be offered on the forthcoming 12-cylinder 760i and 760Li. The xDrive system adds 187 pounds over a standard 750i, with the car’s overall heft redistributed in such a way that only one additional percent of the car’s weight sits over the front axle, which assists the 7 in its handling prowess. The xDrive 750 will command a $2300 premium when it goes on sale this October—which is just in time to help us Snowbelters escape our snowy driveways.